According to “Tropical Topics”online newsletter by Ellen Wells, horticulture students in the Southeast, may qualify for one of 12 $1,500 scholarships awarded by the Sidney B. Meadows Scholarship Endowment Fund. Juniors, seniors and graduate-level students who are residents of the 16 southeastern states could be eligible. Deadline is May 27, so if you think you’re eligible, check out the requirements and fill out the application at the Fund’s website, www.sbmsef.org/. Scholarship recipients will be determined by July 6 and notified soon after. A recent visit to Mounts Botanical Garden in West Palm Beach introduced me to a few “new” plants. Because I visited on a Monday (the garden’s Nursery Guild plant sales section are open from 10 a.m. to 1 p.m. Mondays and Fridays) I was able to buy my one of my favorites seen there, caricature plant (Graptophyllum dictum), often commonly called Jamaican croton. I especially like that this colorful tropical is good for the shade where crotons ordinarily would struggle. This plant also does well in full sun. In both situations it lends a delicate dance of color and contrast with splashes of pink on green with deeper-colored stems. There are other cultivars with slightly different shades. This tropical specimen is a native of New Guinea and is in the family: Acanthaceae. Caricature plant is recommended for Zones 10-11, although with research I found that roots can survive down to 25 degrees. And it blooms with four-inch long red or purple inflorescences on this evergreen shrub which grows two to eight- feet tall, with a two to five-foot spread. It displays glossy, leathery, elliptic leaves, up to six inches long. Keep soil uniformly moist. As an extra bonus, softwood stem cuttings will root in water. A good thing, because this is another of those plants that you will want to share with your gardening friends. Whenever I invite someone into my garden to take a peek at the Brazilian cloak (Megaskepasma erythrochlamys), their usual response upon spying the brilliant one to two-foot tall spikes of blooms is to drop their jaw in absolute awe. I can’t help but do the same whenever my eyes land on this stunning specimen. Hummingbirds seem to have the same reaction as well. This showy tropical will remain in bloom, setting new blooms continually and retaining old blooms for months throughout the fall, winter and early spring. Topping out at about 15 to 20 feet, Brazilian cloak cannot be equalled in the tropical garden. Able to withstand temps down to the mid-20s, it could well be considered a good choice for subtropical gardens (Zone 9b) as well. Although I would be prepared to cover it or have it in a container that could be moved to a safe place in the event of a hard freeze. Adequate moisture and a rich growing medium are a must to keep the big, textured leaves green. Also consider planting something at its “feet” to fill in the area below as Brazilian cloak can be a bit leggy. It can be propagated from cuttings, which is a good thing because once your friends and neighbors see this beauty, they’ll want to grow it too. Color in the shade, is one big gardening challenge. But up to that test is a tropical plant that meets it with color and presence. Tricolor ginger (Jengibre Tricolor) ‘Tricolor’ does have some cold-hardiness, and I have been growing it successfully in a protected location in Zone 9B for years. Just one look at this stunning plant shows that you don’t need blooms to create a brilliance and a stir in the shaded garden. Though some pot/plant tags suggest this as a plant for full sun (six hours direct sun), it is likely you’ll find that sort of exposure will burn the colorful foliage of this plant. Put it in the shade, and you’ll both be happy. Stromanthe ‘Triostar’ will eventually grow to about three feet tall with a spread of the same dimension. Give it plenty of water and a rich growing medium for best performance. In colder climes this could be one of your favorite houseplants ever. I have been moving shrubs around. (Hope all of them survive the transition!) and moved two rose of Sharon bushes Friday, from beside the house to the back of the yard, just to the left of my compost area. They are a variety called ‘Lil’Kim’ which does not grow as tall as do many of the roses of Sharon. The change will “soften” the boulders that surround the compost pit, and do a lot more too. The result has been dramatic! Where those two bushes, that I had to constantly cut back because they were just too big for where they were and were almost eyesores — have now become a focal point and pull the eye to the back of a long stretch of lawn bordered by perennials and shrubs. 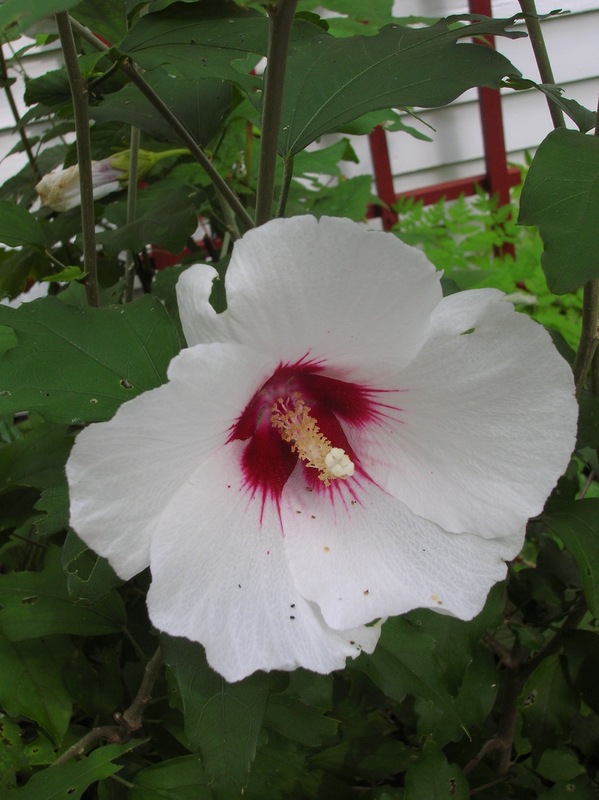 They have big white blooms with scarlet centers in late summer. Where it was formerly mostly green, now there are these big white blooms that just pop out and draw your attention to them. Amazing transformation. I also moved five hydrangeas from obscure positions out to the edge of the yard where they can grown big and provide a collar of color in the back yard. Formerly they too had been tucked here and there and had to be cut back frequently. Now they can spread and look glorious. I got the idea to start moving things around after seeing a neighbor’s garden that is simply gorgeous. A real inspiration. Now, I am keeping my fingers crossed that everything survives. I really had to hack those roots back on those two rose of Sharon bushes. And the same neighbor who provided me with the idea to move things out into prominent areas, gave me some cuttings from a chartreuse (rare color) forsythia that I am getting to root. Hopefully that will add some more color back there once it gets going. 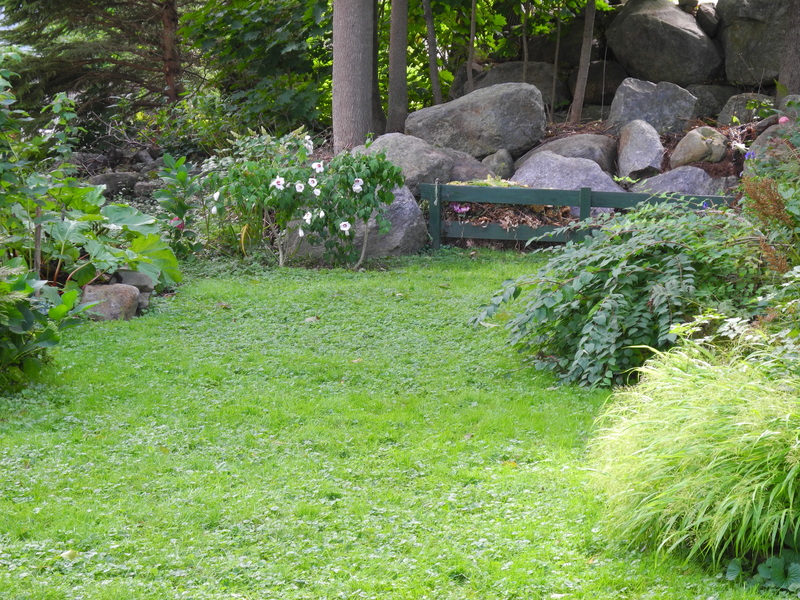 Late summer is actually a good time to move shrubs and move and/or divide perennials. To move an established shrub it helps to root prune the plant a couple weeks before you plan to move it. To root prune, you simply force a shovel into the ground in a circle around the bush, about a foot or two (depending on the size of the shrub) from the main trunk. I like to give the plant a good dose of root stimulating hormone (a liquid concentrate mixed with water) a couple times before moving it. Then water it in well and give it another dose of the root stimulating mixture. Keep transplants watered as needed until the ground freezes. Having fun in the garden! When those cucumbers start coming in, they come on strong. Of course we’ve enjoyed them in salads and as fresh dill pickles (https://gardeningonthego.wordpress.com/2011/09/13/making-fresh-refrigerator-dill-pickles/) and all by themselves. But lately I have been searching for something else to do with cucumbers. 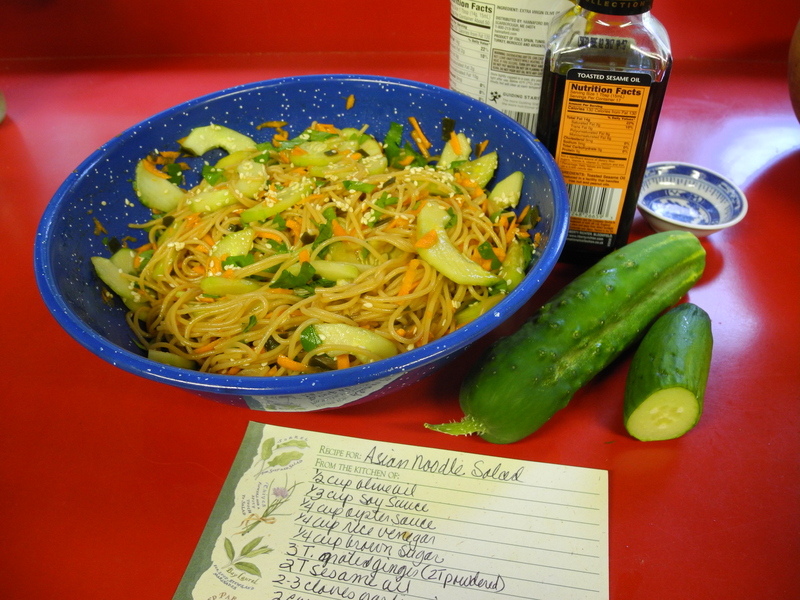 Then I “discovered” this totally cool Oriental-style noodle salad that is perfect for these warm end-of-summer days. My recipe has lots of room for improvisation. Indeed, latest bowl that I mixed up contained bits of dry seaweed which was chopped fine and cooked along with the pasta. Or try adding some steamed, diagonally-sliced snow peas or tender green beans for example. Or maybe slivers of some different greens? This recipe makes a lot, which is good because you’ll want to share. Or if you don’t want to share, you’ll have plenty for yourself. (Warning here: This stuff is positively addictive.) I usually divide the ingredients by half, which results in about a quart and a half of salad, or a good-sized bowl full. That’s enough for four to enjoy it as a main dish or side. The whole recipe is great to take to those pot-luck meals. Cook pasta according to package directions, drain and set aside as you combine all the other ingredients in order given in a large bowl. Stir in pasta. Chill for at least an hour to let flavors mingle. Serve cold. Serves 8. At the bottom is the newer pile where fresh materials are added, and the almost-composted pile is at the top finishing up. If I have to listen to another person’s excuses for not composting I think I am going to scream. They say they have no carpentry skills, and can’t make a bin or cannot afford to buy a bin: You don’t need a bin. All you need is a pile and — yes — it will work. They say they don’t have time: If you have time to put it in the garbage, you have time to put it in the compost pile. They say they are afraid it will look bad: It does not. They say they are afraid it will stink: It will not. They say they are worried that animals will scatter it: If you don’t add meat to the pile — which you should not — you won’t attract animals. If you want to put bones in there, lobster or mussel shells for instance, dig them down deep and cover them up and nothing will bother them. Seriously, folks, composting is not rocket science. Oh yeah, I already said that. I know there have been books written about composting and formulas and yadda, yadda, yadda… But really all you need is a simple pile and it will work. Include garden clippings, dried leaves, grass clippings, kitchen fruit and vegetable trimmings (no meat nor fat which can slow down the composting process), coffee grounds, egg shells, tea bags, etc. and if you make a place for them it will compost. For years I had just such a pile, still do, and it works just fine. Last year we put in three posts and a couple cross pieces to sort of “fence it” off since it is right in sight of the back yard. Even so, it never was unsightly, never had an odor or other caused any problem at all. And basically it is still just a pile. We put up a couple posts with cross pieces to conceal the compost pile. No bins needed. 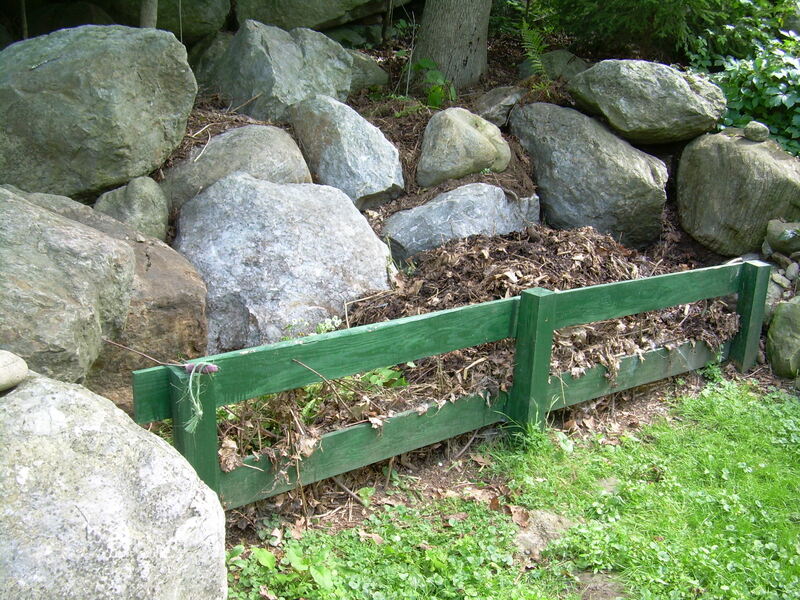 The compost would work without the little fence and wasn’t unsightly before it was added. • In the fall all the raked leaves and garden trimmings go into the compost area. In fact they swallow it up. All winter kitchen trimmings go into the leaves. I just bury new stuff down into the leaves. • In the spring I turn the whole thing with a pitch fork. By then the leaves have settled down some and are actually wet and matted. Turning the pile incorporates some air into the ingredients. • All summer I add new stuff from the kitchen, yard and garden trimmings. • About half way through the summer I turn the pile. By then there usually is a nice layer of almost-composted material on the bottom. I fork the uncomposted things to one side and rake the mostly-composted material into a second pile to finish working. 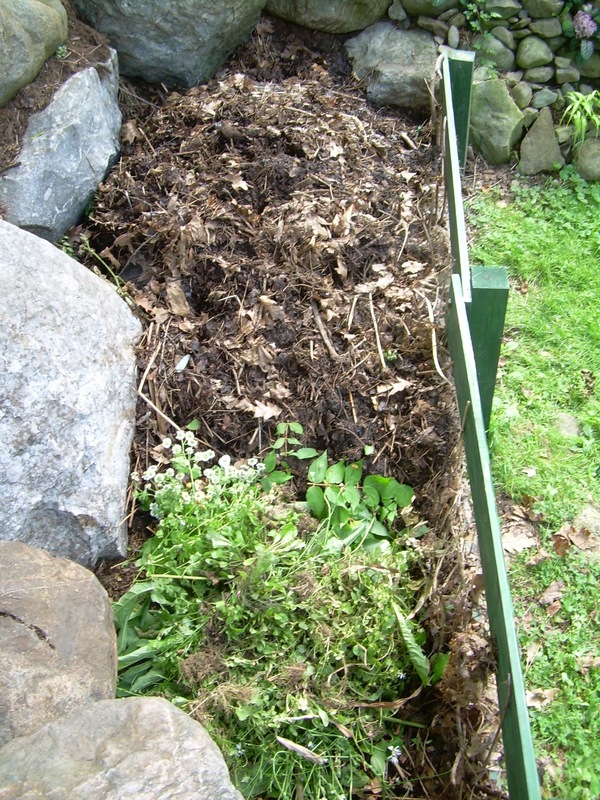 • By late summer the second pile is completely composted, and I remove it to spread on the beds. The newer pile is turned and piled up to be left to work, and a new pile is started where the removed compost used to be. Still two piles. Composting does a lot of good things. FIrst of all it creates beneficial soil supplements that are completely free. Not only is compost free, compost provides your plants with beneficial microbes that do more than just feed them. It also makes them healthier plants and eliminates the need for commercial fertilizers. Composting keeps garbage out of the landfill. It is a simple way you can help the environment and yourself. It’s simple, it’s easy and if you garden you need a compost pile. So, why aren’t you composting?